BEIJING (Reuters) - China's massive export engine sputtered for the second year in a row in 2016, with shipments falling in the face of persistently weak global demand and officials voicing fears of a trade war with the United States that is clouding the outlook for 2017. In one week, China's leaders will see if President-elect Donald Trump makes good on a campaign pledge to brand Beijing a currency manipulator on his first day in office, and starts to follow up on a threat to slap high tariffs on Chinese goods. Even if the Trump administration takes no concrete action immediately, analysts say the spectre of deteriorating U.S.-China trade and political ties is likely to weigh on the confidence of exporters and investors worldwide. The world's largest trading nation posted gloomy data on Friday, with 2016 exports falling 7.7 percent and imports down 5.5 percent. The export drop was the second annual decline in a row and the worst since the depths of the global crisis in 2009. It will be tough for foreign trade to improve this year, especially if the inauguration of Trump and other major political changes limit the growth of China's exports due to greater protectionist measures, the country's customs agency said on Friday. "The trend of anti-globalization is becoming increasingly evident, and China is the biggest victim of this trend," customs spokesman Huang Songping told reporters. "We will pay close attention to foreign trade policy after Trump is inaugurated president,” Huang said. Trump will be sworn in on Jan. 20. China's trade surplus with the United States was $366 billion in 2015, according to U.S. customs data, which Trump could seize on in a bid to bring Beijing to the negotiating table to press for concessions, economists at Bank of America Merrill Lynch said in a recent research note. "Our worry is that Trump’s stance towards China’s trade could bring about long-term structural weakness in China’s exports," economists at ANZ said in a note. "Trump’s trade policy will likely motivate U.S. businesses to move their manufacturing facilities away from China, although the latter’s efforts in promoting high-end manufacturing may offset part of the loss." "Instead of caving in and trying to prepare voluntary export restraints like Japan did with their auto exports back in the 1980s, we believe China would start by strongly protesting against the labelling with the IMF, but not to initiate more aggressive retaliation ... immediately," the BofA Merrill Lynch Global Research report said. "That said, even a 'war of words' could weaken investor confidence not only in the U.S. and China, but globally." 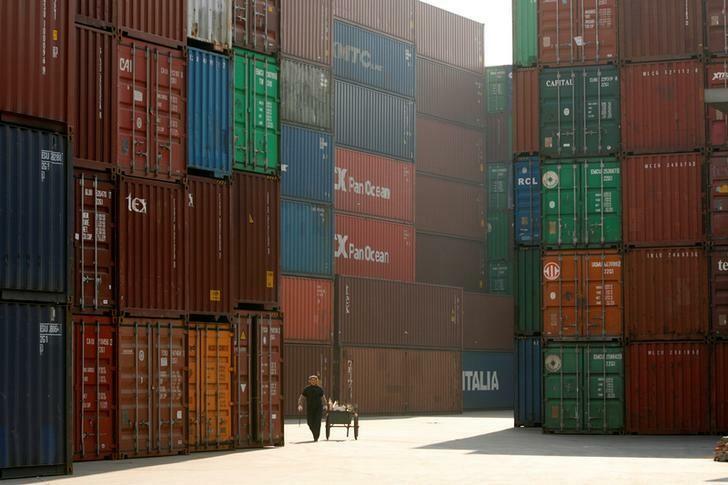 China's December exports fell by a more-than-expected 6.1 percent on-year, while imports beat forecasts slightly, growing 3.1 percent on its strong demand for commodities which has helped buoy global resources prices. China reported a trade surplus of $40.82 billion for December, versus November's $44.61 billion. "Trade protectionism is on the rise but China is relying more on domestic demand," said Wen Bin, an economist at Minsheng Bank in Beijing. Prolonged weakness in exports has forced China's government to rely on higher spending and massive bank lending to boost the economy, at the risk of adding to a huge pile of debt which some analysts warn is nearing danger levels. Data next Friday is expected to almost certainly show that 2016 economic growth hit Beijing's target of 6.5-7 percent thanks to that flurry of stimulus. "It is hard to see what could drive a more substantial recovery in Chinese trade," Julian Evans-Pritchard, China Economist at Capital Economics, wrote in a note. "Further upside to economic activity, both in China and abroad, is probably now limited given declines in trend growth. Instead, the risks to trade lie to the downside...," he said, saying the chance of a damaging China-U.S. trade spat has risen since Trump's appointment of hardliners to lead trade policy. A decline in China's trade surplus in 2016, to just under $510 billion from $594 billion in 2015, may also reduce authorities' ability to offset capital outflow pressures, which have helped drive its yuan currency to more than eight-year lows, ANZ economists said.